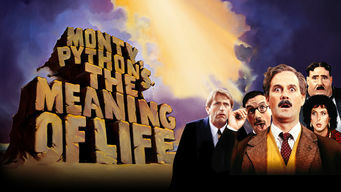 How to watch Monty Python's The Meaning of Life (1983) on Netflix Argentina! Yes, Monty Python's The Meaning of Life is now available on Argentine Netflix. It arrived for online streaming on October 7, 2017. We'll keep checking Netflix Argentina for Monty Python's The Meaning of Life, and this page will be updated with any changes. The no-holds-barred Pythons explore the various facets of life -- from procreation to the clang of a death knell -- in their usual irreverent fashion. From Catholics to insurance salesmen, everyone is repulsively funny, brilliantly vulgar and delightfully gross. Yep, that's life.